My Pc exploded with all the gusto of a fireworks spectactular this weekend. Bright lights, loads of noises. Took out the power in my flat. So a call to a friend to let him know I wasn’t comming back online, and after being told how naughty I was for not putting my pc through a surge protector of any kind. ( I know.. and would you believe it I have two basic surge protectors in my desk draw – ) we determined that it looks like I had killed the powerpoint, and killed my PC’s power supply. My lights were back on once I flipped the circuit breaker back. I was fine to start with – then I got a little anxious – thinking of the consequences of not having a pc – running through my brain – how long could I survive? – When could I get it fixed / replaced – it was only a new PC – I had paid a bit of money for it – its close to christmas – and that I would need to ask someone for help – and no wow – no music, or dvds ( I don’t have a TV because I wouldn” watch it. – and I was frantically thinking what writing have not backed up. So with the help of my friend to keep me sane – and give me hope that It would be ok, I talked to my brother the next morning, after trying to sleep with knots in my stomach – my brother came over, and pulled my pc power supply apart to see the above. Killed by a bug. Death by cockroach. My brother tested to see if his spare ps would power up the pc, ( using a different power point) and and then we went and bought a new Power supply for me and a surge protector board. 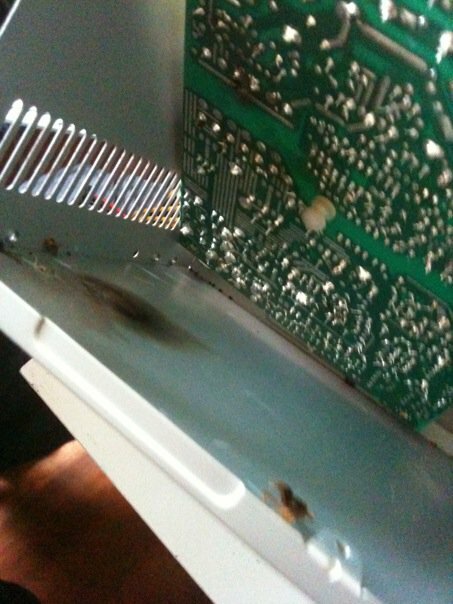 Even though the board wouldn’t have saved the PC because it came from internally and not my power. But it works – it’s all good now – apparently incredidibly lucky it didn’t fry anything else. We run it through a 3d mark test to flex it’s muscles a little, and performace was fine. So I am thanking the tech gods for allowing minimal interrupted pc time. The lesson – I have no idea how that bug managed to fit in there – . Am extremely glad it doesn’t have any friends. Or does it? They may want revenge. Ah Sydney, fabulous place that it is… I haven’t had a cockroach kill my PC yet, but at the last place I lived (for all of 6 weeks) I didn’t use the kitchen. Hello there, just became alert to your blog through Google, and found that it’s really informative. I’m gonna watch out for brussels. not seem to get to any of the major search engines. keys from trusted online sites such as e – Bay.